Ideas are a dime a dozen. Pulling it off is another story. Here are three stories in film that began as an idea. An I.R.S. auditor figures out that he is not a real person but rather, is a character in a book that someone is writing. When he learns that he's soon to be bumped off he goes on a quest. Can he find the author in time to have the end of the story re-written? No doubt the story began with a "what if" question. 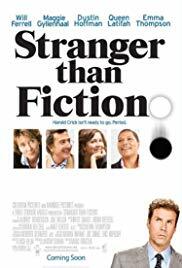 Will Ferrell is the somewhat obsessive-compulsive lead character Harold Crick and he pulls it off. 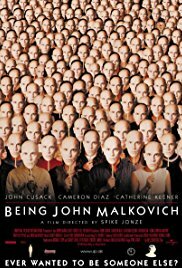 One reviewer of the film at imdb.com states that it could have gone further in exploring the issues it raised and labeled it "Charlie Kaufman Lite." I liked it though. A lovelorn screenwriter becomes desperate as he tries and fails to adapt 'The Orchid Thief' by Susan Orlean for the silver screen. This one, and the next, really are Charlie Kaufman screenplays. With echoes of Carl Hiaasen (Everglades, unusual characters and a plot that veers in unexpected ways) my only suggestion is that at a certain point in time you'll want your seat belt fastened when this film goes off the rails. The storyline reads: A puppeteer discovers a portal that leads literally into the head of movie star John Malkovich. 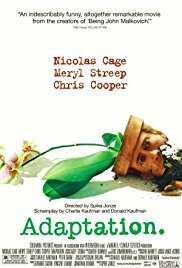 Directed by Spike Jonze, this is another remarkable script by screenwriter Charlie Kaufman, a truly original film that takes you places you can't begin to imagine. This is what "Magical Realism" (Borges, Umberto Echo, Marquez) looks like when translated to the silver screen. Imagination is an amazing thing. Where does it come from? Why is it so active in some and restrained in others? What will they think of next?